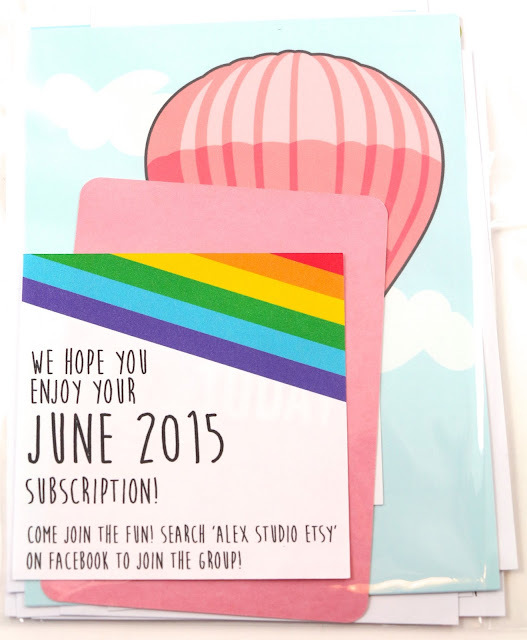 Alex Studio is a shop I've reviewed before here, but they also have a monthly subscription that you purchase each month if you're interested. 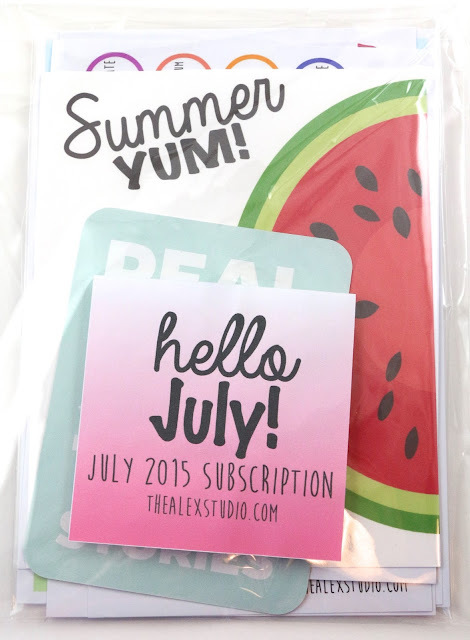 And the August subscription just went up for sale today! You can grab one of those here, and you have the choice between matte or glossy stickers. I usually go for glossy, which is $2 more. I was gifted June's subscription from a friend in a swap. 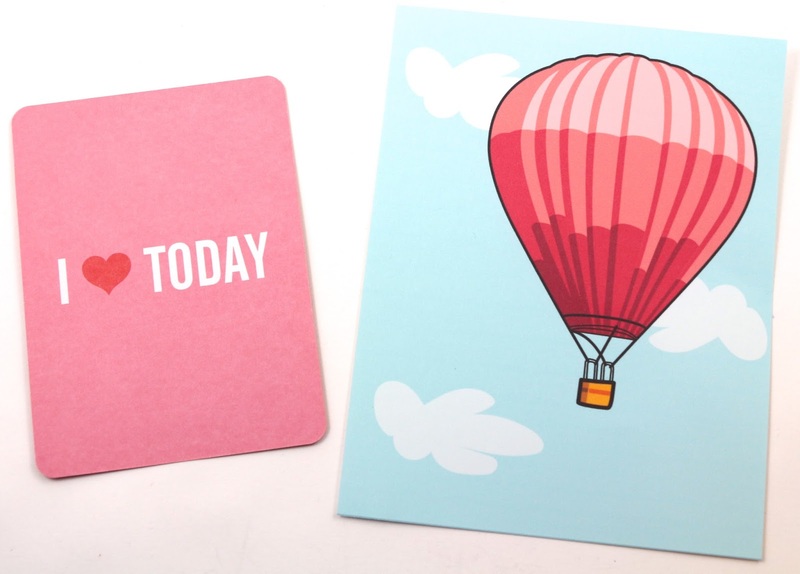 These are little cards you could add a coil clip to and clip them into your planner, or use them as a dashboard. They're cute, but I just don't have a use for them. These wacky holiday stickers are so cute, I love looking at each day and wondering what holiday is that day. I usually just stick these to the top of each day in the weekly view. I like these dot strips, I've been using the red/orange/yellow ones in July, the blue I used in June, and the green ones I put in August. They kind of match those monthly colors, but I like that they can be used anywhere really. 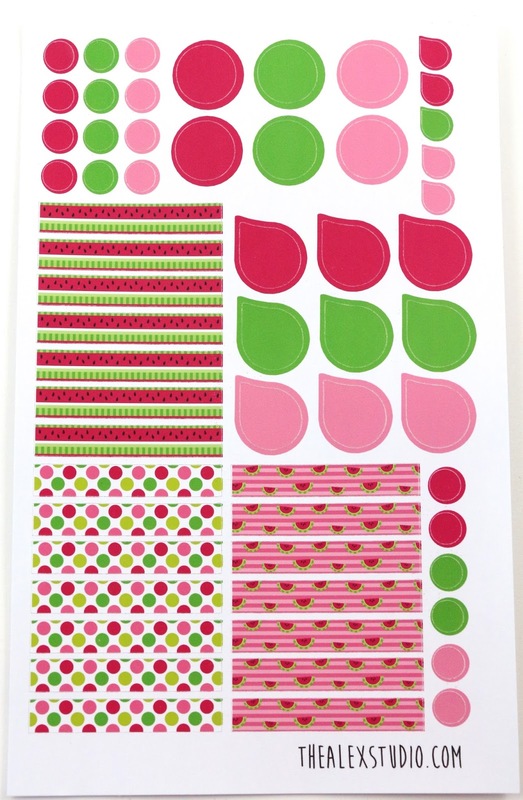 The only downside is that it's too hard to read if you write on them, so they're really only decorative. I love these mason jar and fireflies! I picked a week to use these in August. 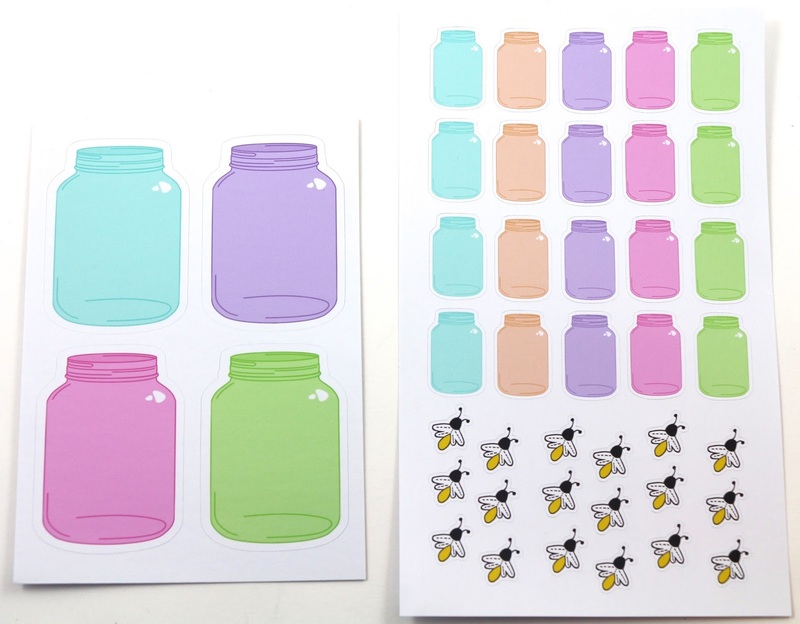 I'm going with a firefly and butterfly theme. 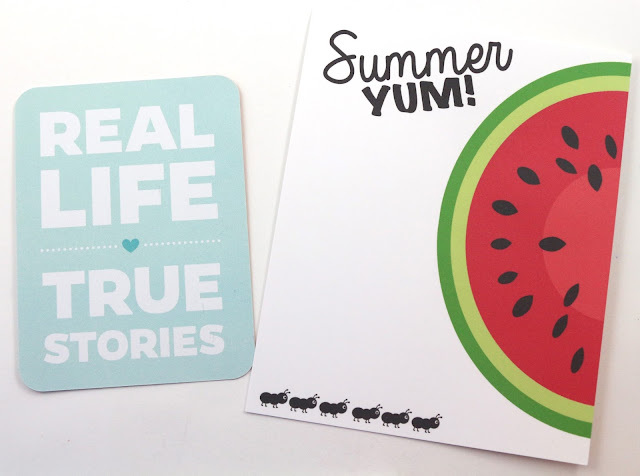 These were probably my favorites from the June subscription. 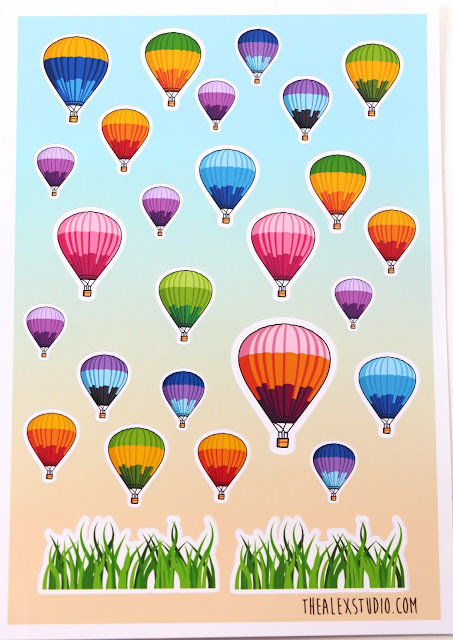 I really like the look of this sheet, and the hot air balloons are cute. These pattern full boxes are fun, but again, hard to write on. I will probably be mostly using them as a background with other more functional stickers over it just so the pattern peeks through a little bit. 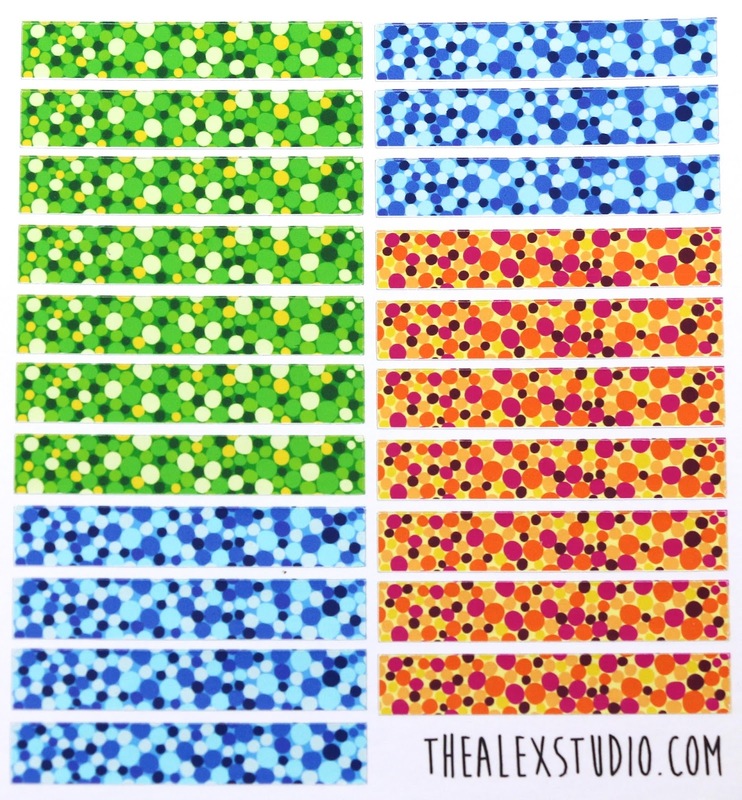 I love the small dots on this page because I always like using them for a sidebar checklist. But I don't love the size of her bigger circles, and the teardrops. They're too small to really be functional. 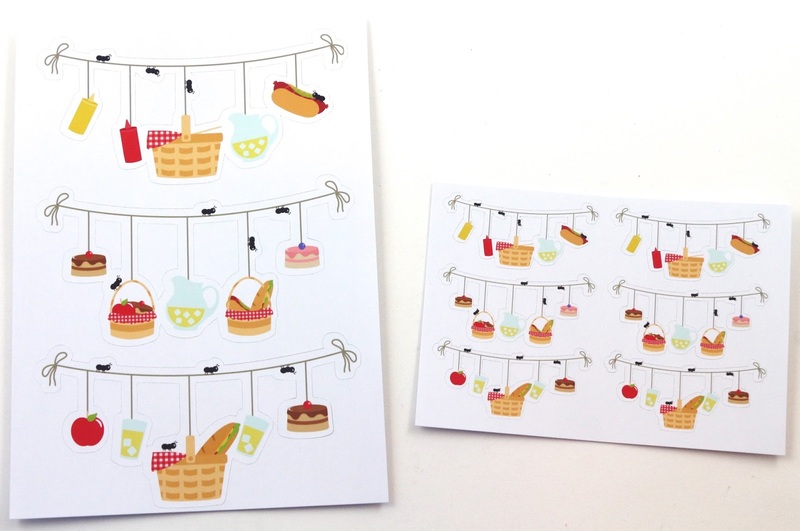 Here are the little cards for July. I will make note that the small cards have lines on the back for writing. But I don't know what to use these for. 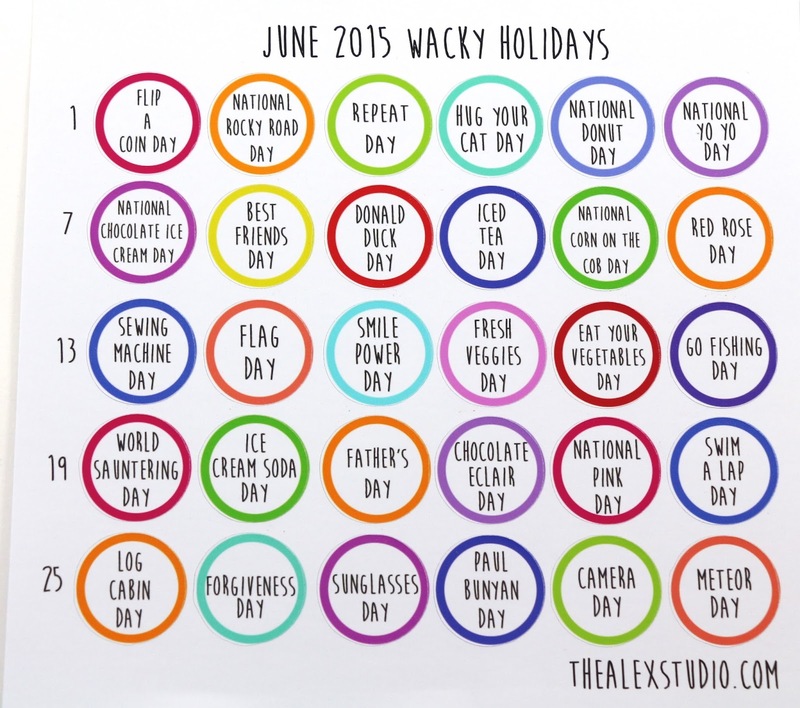 Another sheet of wacky holidays! I think she makes these every month, so they are a really fun addition to the subscription. I really like the small banners, they fit perfectly over a day. 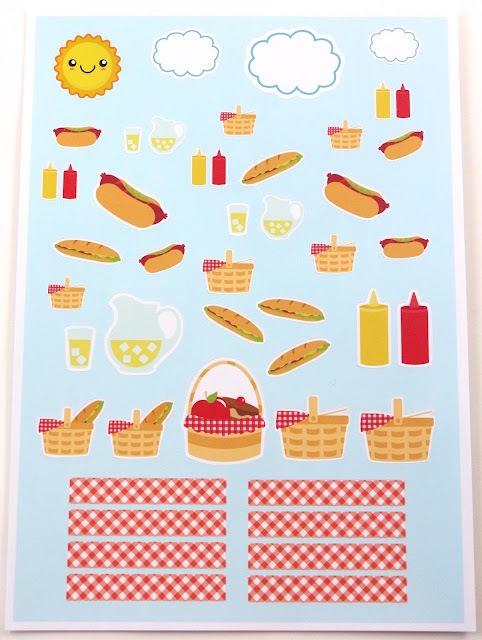 You could use them to denote a picnic, or a cookout or something. But the big ones are too big I think. They cover two days, but they also take up half of the box as well. I just can't give up that much space, so I haven't used the bigger ones yet. I really like these half boxes, they would be a little easier to write on. 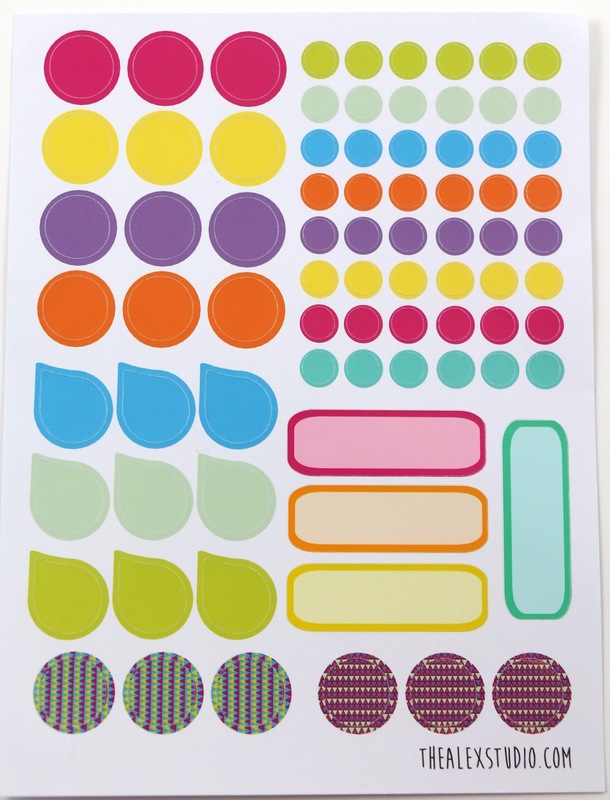 This one is more tiny circles, bigger circles, the patterned strips, and some tear drops. 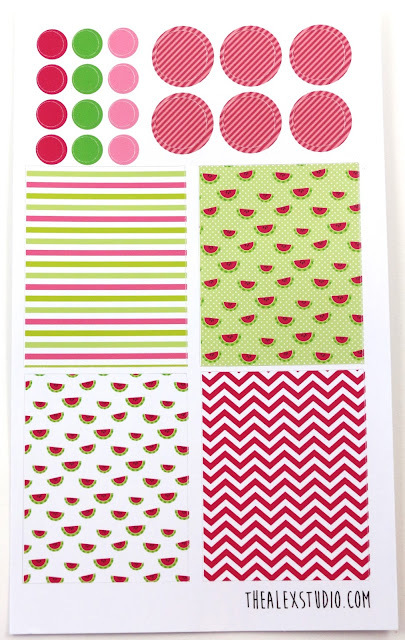 A cute watermelon sticker sheet. These would a perfect addition to a watermelon themed week. 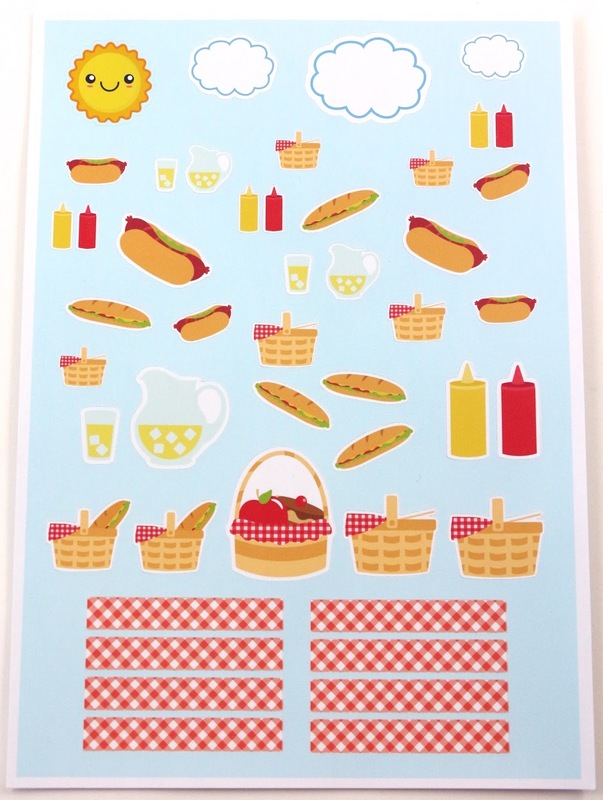 And the last sheet in July's was hot dogs, picnic baskets, lemonade, and some gingham strips. 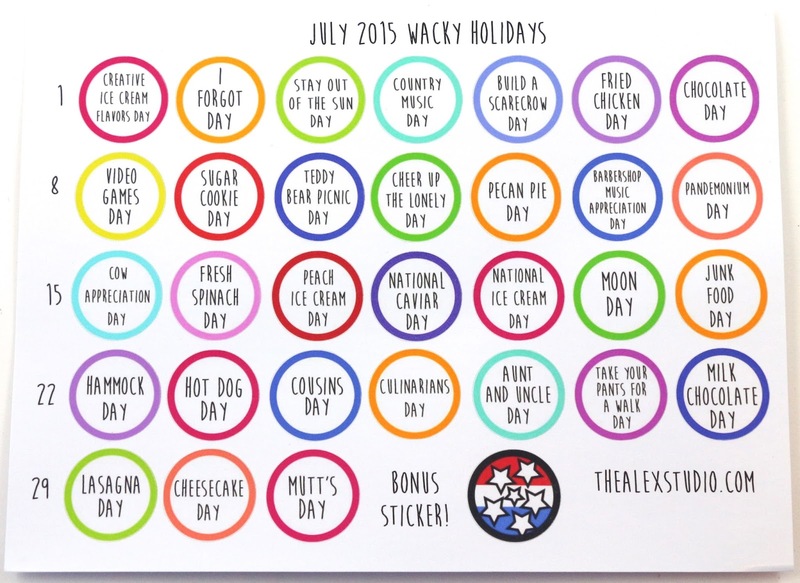 I mostly used these to decorate all of July. Overall, I think the Alex Studio subscription is cute, but I just don't think it fits my planning style. If you like decorating a lot, or just cute designs, it might be for you. But I found that too many of the stickers I wasn't using because they just aren't functional enough for me. 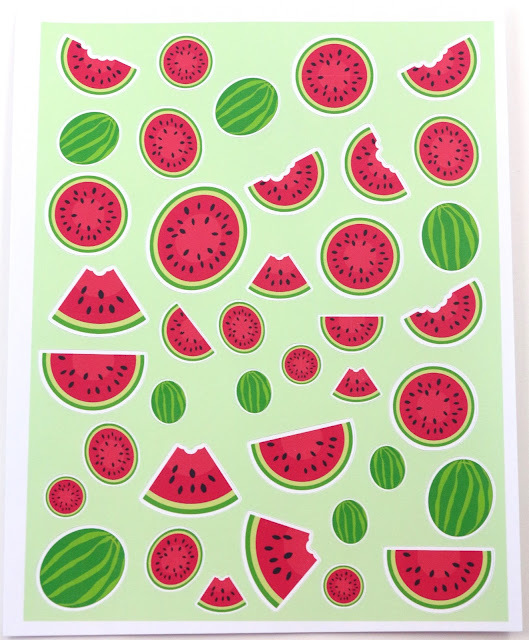 I haven't purchased the August sub, and I probably won't. The subscription goes up on the 1st of the month, and will be sold until the 15th. 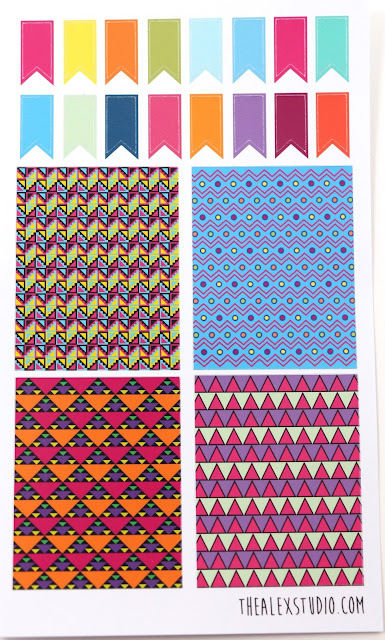 They are shipped with the same turnaround time as the shop, so expect to wait 7-10 business days.